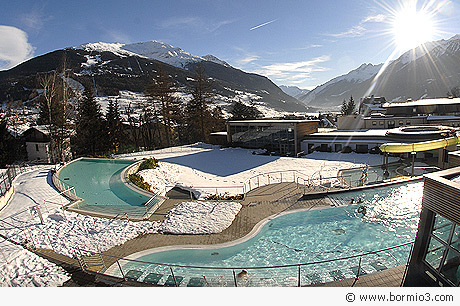 Bormio Terme Spa in the center of Bormio was officially established in 1913. Over one thousand litres of mineral-rich water flow every minute from the thermal spring “Cinglaccia”, located to the side of the nearby river Adda. These spring waters are channelled through pipes to arrive at the Spa at an average temperature of 39.5° C.
In 1920, a new managing company, “Società Terme Bormiesi”, was founded and the first buildings for thermal treatments were built around 1927 along with some preliminary refreshment areas. Following a complete refurnishment in 2004, Bormio Terme Spa is now able to offer a wide range of wellness services. The Spa is mainly divided into two sectors: one sector is dedicated to sport activities whilst the other sector is set for themal treatments such as mud and thermal inhaling therapies. Beside the traditional sauna and steam bath Bormio Terme Spa has many different pools: a swimming pool (27° C.), a pool for babies and children, a semi-covered pool with bubbling jets with breathtaking views on the surrounding landscape. In 2006, a new open-air section was opened. Here, together with the outside pools, you find an area for children with a waterslide and other fun facilities for the little ones. The solarium faces the ski area of Bormio. The services offered by Bormio Terme are numerous and varied: classic thermal treatments, therapeutic massages, linfo drainage and foot reflexology. Bormio Terme Spa also has its own beauty centre where you can buy completely natural cosmetics. A section of the Spa is dedicated to rehabilitation. The Bormio Terme main building also houses a modern and well-equipped fitness centre with more than 300 square metres dedicated to it and a conference hall with more than 250 seats. A new wellness area called “Thermarium” was opened in 2007.